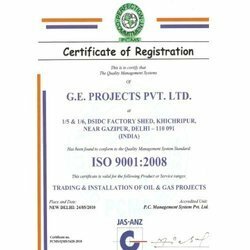 Established in the year 1997 at New Delhi, India, “G E Projects Private Limited” is recognized as one of the reliable Traders, Exporters and Suppliers of LPG Propane storage and handling system, LPG Reticulation System, Gas Cylinder Manifolds, HSD Tanks and Pipeline System. Our product range is manufactured by ourself and our trusted vendors to cater to the needs of the industry as per the internationally defined quality standards. Our product range is regularly inspected by our quality controllers to ensure a flawless product range that conforms to the set engineering standards. These products are largely used in a large number of industries for various purposes. We are backed by a high end warehouse and a team of highly qualified professionals that enables us to provide unmatched premium quality products to our clients. Our product range is procured from some of the most trusted vendors of the industry, who manufacture these products from high grade raw material as per the international quality standards. These products are highly treasured by our clients for their sturdy construction, reliable performance, easy installation and low maintenance. Owing to the above mentioned factors, we are able to create a huge client base across the Indian Subcontinent, East Asia and the Middle East. We are blessed with a huge and well-structured infrastructure facility. It is further divided into various departments to carry out our manufacturing, trading and exporting activities in an efficient manner. We have employed highly efficient and experienced personnel. 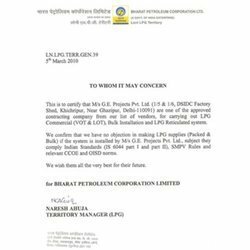 They ensure to offer the best range of LPG Propane storage and handling system, LPG Reticulation System, Gas Cylinder Manifolds, HSD Tanks and Pipeline System. Our facility is fully equipped with the state-of-the-art tools and equipment. Thus, we are able to deliver the best quality services that are in compliance with the international quality standards.